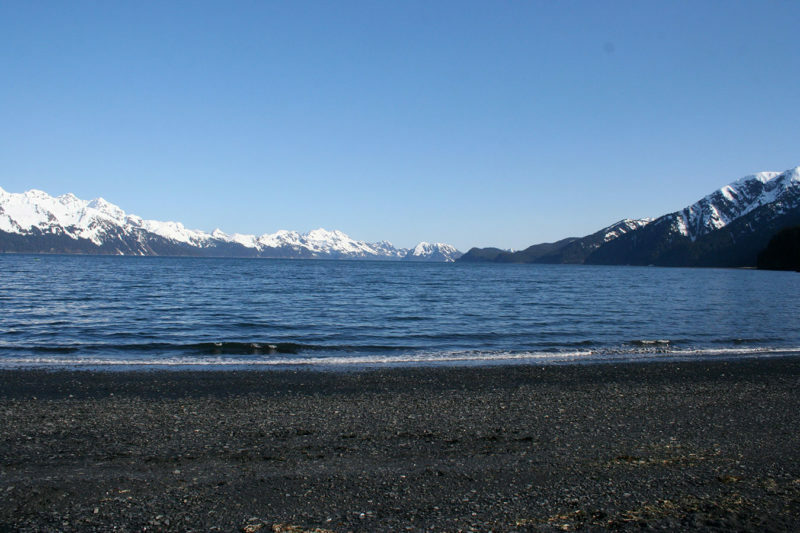 In 1792, Alexander Baranof, Russian explorer and governor of Russian America, sighted and named a bay off of the Gulf of Alaska. Because the day he sighted it was Easter Sunday, he named it Resurrection Bay. The town of Seward was founded officially in 1903, named after the secretary of state responsible for the purchase of Alaska from Russia, William Seward. This past Monday was Seward’s day, and since Easter Sunday is coming up, it seemed like a perfect time to discuss why you should make sure this little town is on your Alaska road trip itinerary. Seward is the gateway to Kenai Fjords National Park, and one of the best ways to view the park and its abundant wildlife is on a boat tour. Most tours visit Aialik Bay, the northernmost fjord in the park and the most easily accessible. There are 2 active tidewater glaciers in this fjord, and getting there multiple chances to view wildlife on the way there and back, including sea lions, orcas, humpback whales, Dall porpoises, puffins and plenty of other types of sea birds. Do your research, as there are multiple types of tours on offer from the several different tour companies and charters, and they all appeal to different types of travelers. Exit Glacier is the portion of Kenai Fjords National Park that is accessible via land. It’s a popular spot, and since you can walk to it, you can take your time getting your pictures and selfies. A paved trail takes a leisurely path toward the glacier, and then splits into an easier lower trail and a more rugged upper trail. A more strenuous trail offshoot takes you to the edge of the Harding Icefield, which covers a good portion of the Kenai Peninsula and feeds all of the glaciers in the National Park. For an even more adventurous experience, local tour companies offer hiking tours on top of the glacier with specialized gear. The Sea Life Center is a marine wildlife research and rescue facility. View seals, sea lions and sea birds in permanent habitats at the center, and take a behind-the-scenes tour or an animal encounter tour to learn more about the research the center carries out and about the animals they support. You’ll learn about the life cycle of the 5 salmon species that return to Alaska waters each summer, and out on the deck, you might catch a glimpse of the sea lions and otters that like to play just offshore. For the coastal hiking experience, head down to Lowell Point and hop on the Tonsina Point trail. About a mile and a half of forest and mountain hiking will bring you to a broad expanse of beach (at low tide) and a couple of salmon-spawning creeks. Popular on sunny days among locals and tourists alike, Tonsina is a relatively easy hike with rewarding views. If you’re ambitious and adventurous, you can continue on 3.5 more miles to Caines Head State Park, site of an old WWII army fort. The catch is that the “trail” is the beach that is exposed during low tide, so it can only be hiked during the period when the water is far enough out to reveal the beach, usually 2 or so hours before and after low tide. Mt. Marathon is Seward’s most famous mountain and the trail up its flank its most famous trail. A race is held annually on this trail, during Seward’s 4th of July celebration, and has become one of the more popular spectator events in all of Alaska. The trail follows the ridge line up to the race summit, and then follows a scree slope down into an avalanche chute to the bottom. For the race, nearly a mile is added at the beginning and end as runners start and finish in Downtown Seward, but the summit itself is at about 3,000 feet. On any day other than July 4, you can hike the race trail to get a sense of what the runners go through over the course of the race. Alternatively, you can hike up to the Mt. Marathon bowl, where you’ll find alpine tundra and abundant wildflowers, along with creeks and waterfalls. The views of Seward and Resurrection Bay on either of the trails is unparalleled. Take a half-day tour kayaking tour or, if you’ve got experience, rent your own, and cruise Resurrection Bay at water level, where you’ll notice the intertidal zone wildlife like starfish and anemones, might make eye contact with a sea lion or an otter, or may come across hidden waterfalls and scenic coves that you just can’t get to any other way. Ready to take on some of these adventures? Your travel van can get you there! Give us a call with questions, or book your travel van now! Don’t forget about our May Special—you save when you’re an early bird! Come see us this Saturday at the Alaska Summer Showcase! We’ll have a van on display, and we’ll be raffling off a May Special 2-night rental. Don’t miss out!